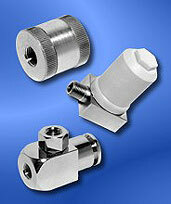 AIMS offers an extensive range of plastic and metal miniature in-line filters, with a barb or threaded ends and stainless steel mesh or high density polyethylene filter material. * Specifications may vary depending on elastomer, environment and media. 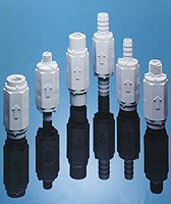 In-Line Filters are designed for the removal of most visible particulate in aqueous solutions and gas streams. In-Line Filters housings are manufactured in Nylon, Polypoylene and Clear Polycarbonate materials and are assembled with either a Stainless Steel filter or a High-Density Polyethylene (HDPE) filter. Stainless Steel are mesh filters with 100 mesh count for larger particles or 200 mesh count for fine particle removal. HDPE filters are fiber filters with a 45 to 90 micron density (HDPE 4903) for larger particles or a 90 to 130 micron density (HDPE 4913) for fine particle removal.